8 May 2014. Computer scientists and medical researchers at University of Illinois in Urbana-Champaign and Chicago designed a mobile app that uses technology already built in today’s smartphones to track basic health indicators. The team led by Illinois computer scientist Bruce Schatz appears in the 10 May 2014 issue of the journal Telemedicine and e-Health. The findings will also be presented later this month at a meeting of the American Telemedicine Association in Baltimore. Schatz and colleagues are seeking a way of easily capturing health data on a large scale with, to the extent possible, everyday technology. While smartphones are a ubiquitous device — found in pockets and purses of nearly 6 in 10 Americans as of January 2014 — they require extra sensors to capture vital signs, such as heart rate or blood pressure, or like pedometers, capture only numbers of steps. In addition, the growing number of mobile fitness apps are aimed more at healthy people to track their achievements, rather than people with chronic conditions, who are more numerous and need feedback for themselves and their health care providers. Thus the Illinois team worked with the basic smartphone technology to design smartphone software to fill this gap. A person’s gait is a function of several systems in the body working in concert, thus changes in speed or mechanics in walking can be indicators of problems in those systems. A standard measure of walking ability used by physicians is the six-minute walk test, originally designed as an indicator of exercise tolerance for people with chronic respiratory disorders or heart failure. As the name implies, the test asks patients to walk back and forth along a measured distance for six minutes. The Illinois team adapted that test to evaluate GaitTrack. In their evaluation, the researchers enlisted 30 patients at the university’s medical center in Chicago with COPD, asthma, or both. The GaitTrack software was installed on Samsung Galaxy Ace smartphones, a mid-range device running the Android operating system, with the software recording data from the phones’ accelerometers. 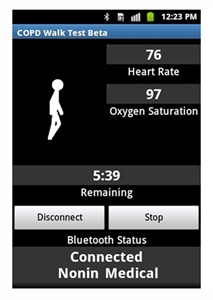 The phones also captured heart rate and blood oxygen levels with a pulse oximeter connected with Bluetooth. The results showed smartphones with GaitTrack could monitor the distance covered in the six-minute walk tests more accurately than more expensive medical accelerometers. The researchers also measured lung capability, using a standard forced expiratory volume in 1 second (FEV1) test of pulmonary function, and used the model and algorithms to predict a patient’s FEV1 score from the data captured by GaitTrack. The results indicated GaitTrack could predict lung function with nearly 90 percent accuracy, within different age and gender categories. Schatz and colleagues next aim to test the device on larger samples of patients, and prepare the software over the next several months for public availability. Schatz sees the software running as a background program that can alert health care providers if a patient’s gait changes markedly, indicating a potential health problem.